Tony Tyler, Director General and Chief Executive of IATA, discusses New Distribution Capability (NDC), part of a long tradition by the airline trade organisation for commercial innovation (as opposed to the technical/engineering side of things). 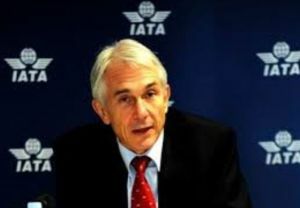 A former CEO of Cathay Pacific, Mr Tyler took on the IATA hot seat in July 2011 and follows in the tradition of former airline chiefs heading the industry worldwide. Seventy years ago this month, 57 airlines joined together to create the International Air Transport Association (IATA). Promoting safety, building standards, sharing expertise and partnering for mutual benefit – these are part of IATA’s heritage and our continuing mission. In 1972, the first Billing and Settlement Plan was introduced to facilitate and simplify the selling, reporting and remitting procedures for IATA accredited travel agents and to improve financial controls and cash flow for participating airlines. In 1983, IATA established the Automated Ticket and Boarding Pass, allowing information to be printed on the face of the ticket and encoded on a magnetic stripe on the back which could be read by computer. A quarter of a century later, the full capabilities of internet sales began to be realized with the transition to e-tickets and soon thereafter, bar-coded boarding passes that could be printed at home. Now it is time for the next major transformation: The New Distribution Capability (NDC) will change the way air travel is retailed by giving travel agents and travel management companies (TMCs) the capability to access features and options typically available only on airline websites. The demand is clear: last year air travellers spent an estimated US$28.5bn on such things as on-board food and beverages, checked baggage, premium seat assignments, and early boarding, according to IdeaWorks Company and CarTrawler. Yet few of these ancillary products and services were purchased through travel agents or third party travel sites because they are not easily accessed by agents. NDC aims to close this gap. NDC is not a system. It is a travel industry-supported programme for the development and voluntary adoption of a new, XML-based (internet language) data transmission standard for communications between airlines and travel agents. As such, it replaces the pre-internet standard common today. While current global distribution system (GDS) products are all aimed at supporting airlines’ need to distribute full, rich content to travel agents, each GDS has developed these products using proprietary standards, rather than the open and global standard being offered by NDC. On the technical side, the first set of end-to-end NDC schemes were released, allowing any travel technology supplier to start building their road map for the next generation of NDC-based airline, agency or corporate booking solutions. Meanwhile, the number of airlines participating in NDC development continued to grow, with more than 14 pilots underway or announced. Lastly in terms of market adoption, all three major GDS providers endorsed NDC and said they would use the NDC standard should their airline partners ask them to. In addition, IATA reached agreement with a coalition of national travel agent associations to carry out a study to look at options that could benefit travel agents as the NDC XML standard is considered for implementation by airlines and technology providers. There will be challenges as the industry transitions from pilot programmes to widespread implementation. To help support this transition and to spark and support innovation, IATA partnered with Travel Capitalist Ventures, an international private equity and venture capital firm to create the NDC Innovation Fund. This fund will support innovation in airline distribution by investing in small- and medium-sized companies seeking to develop solutions which support airlines and agents as they leverage the enhanced distribution capabilities enabled by the NDC standard.